Five Round Plates (6 , 10 , 14 , 18 and 22 ) separated by a threaded 5 aluminum rod. Base has a 5 scrolled leg. Use the plates as shown or create your own custom display. Can take plates out for a smaller number of cupcakes. 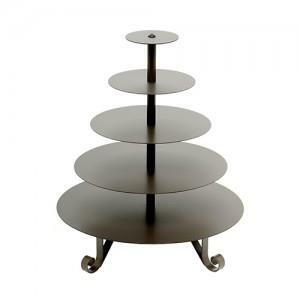 Perfect for catered presentations, dessert buffets and cupcake displays. For weddings, you can put a cake on the top plate to cut. 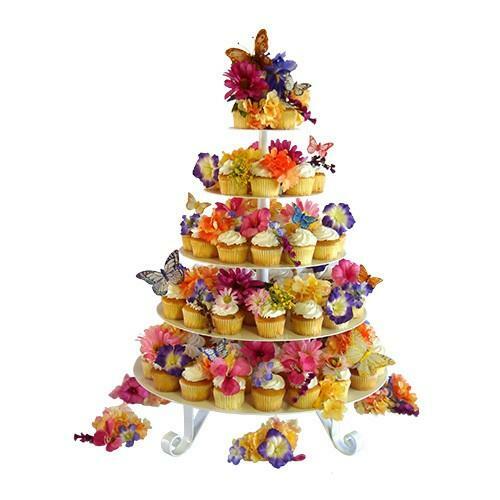 * Please call us for any questions on our white cupcake tree round rentals in Fort Madison IA, serving Southeastern Iowa and Western Illinois.